Full-color photos. 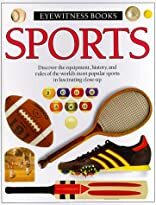 From baseball and football to archery and squash, "ancient and modern equipment, rules, and history are highlighted in Sports, an all-star winner for enthusiasts of the two dozen varieties covered through the sophisticated photo essay format. Featuring spectacular close-up photographs, this is an ideal attention grabber for reluctant readers and young teens." --(starred) Booklist. About Tim Hammond (Author) : Tim Hammond is a published author of children's books and young adult books. Some of the published credits of Tim Hammond include Sports (DK Eyewitness Books).